GETTING ACQUAINTED WITH YOU ~ On your first visit, we will ask you for and health background information. This information will help us complete insurance forms and/or other documents required for your care. More importanly, your health background gives us a baseline history to aid us in providing appropriate dental care for you. Please keep us informed regularly of any changes to your basic information (such as contact and insurance information), as well as notable developments in your overall health. Also, Please inform us of any change in name, address, or phone number. Please try to explain your needs and problems as accurately and as thoroughly as possible. APPOINTMENTS ~ It is necessary that we work by appointment, but we also recognize that emergencies can happen and we do our best to acommodate patients with urgent needs. From time to time, this may cause a delay in our patient schedule; however, we always do our best to honor your original appointment time. If you cannot keep a scheduled appointment, please give us at least 24 hours notice so that someone else may be able to use your appointment time. Please let us know as far in advance as possible if you must change an appointment. 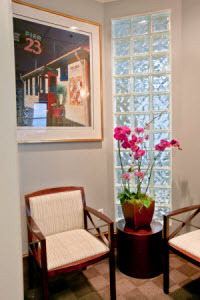 CONSULTATION ~ Because of the nature of our practice and our location in a professional building, we do have the advantage of in-depth consultation when necessary. Also, we freely consult with specialists in other areas when we feel it is advisable for your care. We are all dedicated to providing you with the best dental care possible. AN ERA OF CHANGE ~ With the recent advances made in dentistry, we know that we can give better care than ever before. Dental care is now so thorough that if patients are diligent with their daily oral hygiene, we know that it is possible for you to keep your natural teeth for life! The best long-term oral health for you and your family is our goal. DIAGNOSIS ~ There are over 200 diseases which can occur in the mouth and jaws; some life threatening. In the interest of maintaining your dental health, we'll examine your mouth thoroughly to determine the presence of any disease. If we identify any diseases or other problems, we will develop a treatment plan and recommend a program that we believe will restore your mouth and teeth to optimal condition. We will discuss findings with you thoroughly and expect to address any questions about the condition and treatments that you may have. RESPECT FOR YOUR TIME ~ Whenever prudent, we try to complete treatment in as few visits as possible, and make every effort to remain on schedule. We feel that all our patients' time is valuable and, with few exceptions, can assure you that we will be punctual with your appointments. For the sake of all our other patients, we ask that you make the same commitment to respecting the value of their time and ours. A JOINT RESPONSIBILTY ~ Total dental wellness is dependent on healthy teeth and supporting bones. In addition, occlusion (the way the teeth fit together) has a great deal to do with the life expectancy of your teeth. We aim to eliminate as many problems in these areas as possible. And -- like any good dentist -- we'll insist that you need to do your part to keep your mouth healthy. Frequent and regular brushing and flossing are just the start (and we'll even show you how to do it properly). INSURANCE ~ As a convenience to you, our office will submit charges for services to your insurance carrier, but we consider patients primarily responsible for their own insurance accounts. The service provided by any dentist amounts to an agreement between the patient and the office. The insurance relationship constitutes an agreement between the carrier and the patient. Please give us complete and accurate information regarding your insurance coverage. FOLLOW UPS ~ We maintain a well-organized recall system which requires cleaning and examination for our patients at regular intervals. Regular care means you enjoy a more attractive and confident smile, greater comfort and peace of mind, and an ability to chew efficiently without worry.